Coastal Living is more popular than ever, and despite recent decreases in house sales in Tauranga, the property market in Papamoa and Mount Maunganui continues to rise. The best way to get, and retain, value in this market is to choose a home that has been crafted to perfection. Luckily for beach lovers, we have some architecturally-designed house and land packages for you to snap up! Read the full report of the current Tauranga property market below. House sales drop as property values climb 30 percent! Tauranga property values have jumped 30 per cent in two years while the number of sales has remained static compared to last year. Data from the Real Estate Institute of New Zealand shows sale volumes in Tauranga dropped 5.6 per cent last month compared to June 2015 but volumes in Mount Maunganui and Papamoa increased 8 per cent over the same period. In total there were 289 houses sold last month compared to 290 across the same month last year. Despite that, home values are continuing to rise. Statistics from QV reveal house values soared 32.6 per cent to $599,915 in June from $452,431 in June 2014. The Real Estate Institute also recorded an increase in values over the last year. QV Tauranga registered valuer David Hume said the market was still “very strong in the Bay of Plenty, with new benchmarks being set on a regular basis across all sectors of the residential property market”. REINZ regional director Phillip Searle said vendor expectations were making it more difficult for first home buyers particularly in Tauranga and Hamilton. Demand remained strong and the supply of listings continued to fall away creating more competition, he said. Ross Stanway, chief executive of Eves and Bayleys Real Estate said Tauranga was gaining a reputation outside the region supported by a strong economy. “The property market is only ever a reflection of how people see the region. Mr Stanway said he did not think the market would slow, “if anything it will grow even more because of the competitive advantage that our region has to offer”. Ray White Realty Focus in Mount Maunganui and Papamoa owner Greg Purcell said vendors expectations had “leap frogged”. Feedback from agents who had done property appraisals showed people were holding back from listing primarily because they were afraid they could not find anywhere to live, he said. “But they have got to realise they can call the shots in nominating the settlement date. Mr Purcell said every cycle was finite. “No one knows if that is tomorrow…so now is not a silly time to be doing things”. First National Mount Maunganui, Tauranga and Omokoroa owner Anton Jones said June was a record month for sales and prices. Demand for properties had not slowed over winter he said but there was a shortage of vendors because they often looked to spring to list. ASB economist Kim Munday said the housing market remained tight and home loan lending had also lifted. In ASB’s view the Reserve Bank would cut the OCR by 25bp in August. Myvalocity managing director Carmen Vicelich said while first home buyers or young families were a large part of the market, it had seen baby boomers that were settling for their retirement. Home on small section sells for $700,000! A quaint, colonial-inspired 1950s house on a 141sq m section in Otumoetai has sold for $700,000 fetching $292,000 above its rateable value. 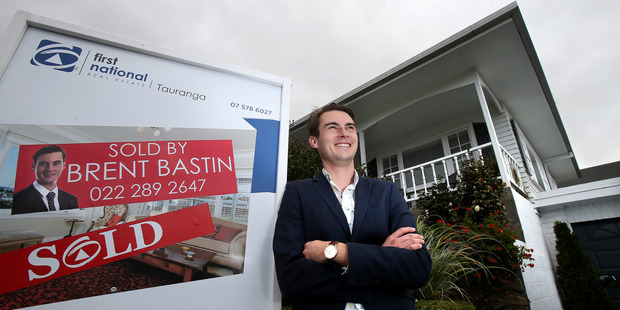 First National Mount Maunganui, Tauranga and Omokoroa real estate agent Brent Bastin (pictured) said the property sold to an Auckland buyer at auction via a telephone bid last month. The 26-year-old said the property had a fabulous location and was close to the Cherrywood shopping centre with sweeping ocean views over to Mauao. The three bedroom, refurbished, one bathroom house with a single garage was on a cross-leased section with an adjoining duplex. Interest in the property was good from day one, he said and the marketing campaign included a funny video “that just worked”. No stranger to utilising social media and Facebook his short “silly films” had received thousands of hits including one were he dressed in combat gear on a mission. He then shot a perpetrator and reported room by room footage back to his base. “I love real estate…me and my team do things quite differently like silly Facebook videos because we have so many people externally coming to visit these houses it’s a great way of marketing to a slightly different perspective. He also liked to conduct an auction on site to create the emotion, he said.